Photo Friday= an opportunity to share some of what is beautiful and wonderful about life. Many people love the beach, but I love a specific beach. Folly Beach. It's in kissing distance to Charleston, South Carolina. (Another place I love.) The word folly is an Old English word meaning dense foliage. For me, I prefer to think about it meaning a frolic or caper. 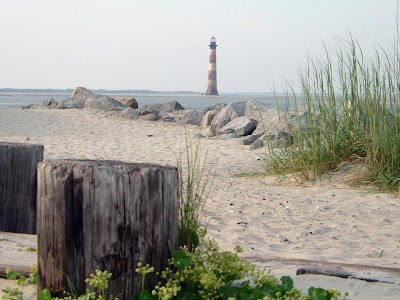 I have so many awesome memories of Folly Beach. I've been there several times but it's been about 4 years since the last time. I am not sure when I'll be back there next but it won't be soon enough! For me Folly Beach represents a life without cares and concerns. Every day is truly a vacation. Countrymouse and I entertain thoughts of retiring there. I suppose time will tell. So even though I won't be visiting Folly this summer, I can look at pictures like the one above and sigh a little sigh as I picture myself there. That is a fabulous picture! You should have a huge print of it up on your office wall, so you can vacation at a moments notice.